Bring your own mask! Or wear a masquerade costume! Join the dauntless Prince Prospero and his courtiers at a wild masquerade ball in their remote, exotic castle. It’s true; a horrifying plague is devastating the countryside, but behind these walls, in a maze of sensuously embellished rooms, beats the heart of life. Here, there is music, there is dancing, there is a reverie of bizarre and voluptuous costumes, a multitude of dreams. There is beauty, there is pleasure, there is wine. All are safe, fear is forgotten…until the ebony clock strikes twelve…Who is that strange masked figure? Who dares to lurk among us like an apparition of the Red Death itself? Who dares insult us with this mockery! 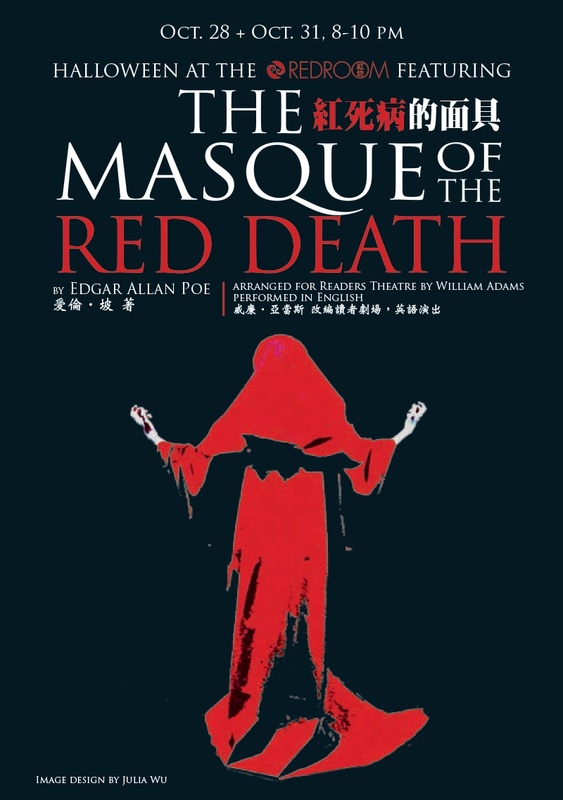 The Masque of the Red Death is a classic tale of terror by the 19th century American writer Edgar Allan Poe, father of the modern horror story. Written in 1842, “The Masque” is now well-entrenched in popular culture, with numerous film, stage, audio, computer game, and graphic novel adaptations. 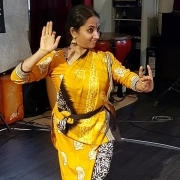 Our version is performed in a unique ensemble style of Readers Theatre that combines storytelling with music, movement, and creative staging. 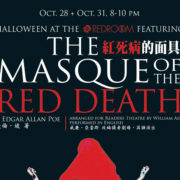 We invite the audience to enter the imagined world created by Poe’s extravagant language and compelling images. Red Room is a non-profit organisation. The entirety of the entrance fee is to cover the expenses necessary to host such an event. 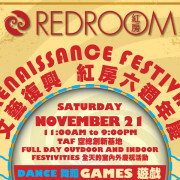 Red Room opens its doors on November 21st to celebrate a 6 year journey, and its rebirth at the Taiwan Air Force base. On November 21 2015, we will host a full day of outdoor and indoor festivities. Watch our website and facebook page for updates on the wonderful activities we have planned, and we look forward to seeing you on November 21st! Red Room presents an ALL DAY INTERACTIVE FAIR , INVOLVING THEATRE, MUSIC, FOOD, COSTUMES, BODY PAINTING AND MORE FOR EVERYONE! 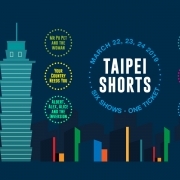 for the purpose of building and creating a shared community in Taiwan. Our 6th year anniversary is a festive occasion to celebrate all of the supporters, and members as well as newcomers of the Red Room community for the love of art, passion, and the revival of the arts at the Taipei Air force Innovation Base. Contact us directly at [email protected] or on Facebook. 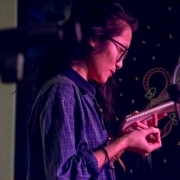 Support the Red Room Community by running an interactive activity, a handicraft booth, or even having your band join to perform on the full day of festivities! 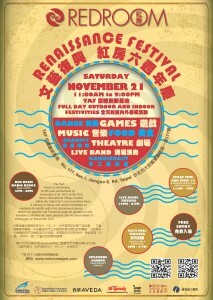 To raise awareness of the Red Room International Village, in association with the Taiwan Air Force Innovation Base. 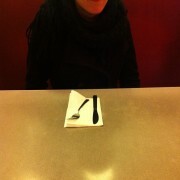 Dinner and a Show will be having the first showcase at the Red Room’s 6th Anniversary, indoors from 2:00 PM to 4:00 PM. Please come over on the 21st and support both the Red Room and us, and we hope that you have a really good time! Travel by MRT:［Zhongxiao Xinsheng Station Exit 6］Walk straight along XinSheng S. Road , then turn left on Jinan Road Sec.2, continue down and you’ll spot the entrance.